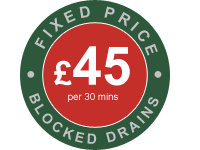 In most cases a blocked drain can be cleared manually using our Water Jetting or Electro Rotary tools – CCTV Drain Survey’s are required when a blocked drain becomes more persistent and the issue is more serious. At AlfaClear Drains we use the latest CCTV Survey equipment to determine the root cause of the problem. This includes inserting our digital drainage camera into the drain and making a CCTV recording of the blockage. We can carry out all CCTV drain inspections to any diameter of pipe work ranging between 24mm and 300mm.